Did I finish? : Yes, although I drew it out because I was reluctant to leave Selene! One-sentence summary: Cleopatra's daughter has become Queen of Mauritania faces tension in her marriage, her new home, and her family as she struggles to embrace her power and destiny. First line: I am nature. Do... I love Dray's mix of historical fiction and magical fantasy? : YES. I'm shocked some readers have reacted so negatively as I think the mix of genres is a fantastic fit, and Dray handles it in a way that feels authentic and natural to the story and characters. Do... I love Dray's blog? :YES. If you're interested in the writing process, start reading now, because Dray is open and honest about her experiences in researching her novels, writing them, and adventures in authordom. Buy, Borrow, or Avoid? : Buy or borrow after you read the first book! Why did I get this book? : I read the first book and loved it. 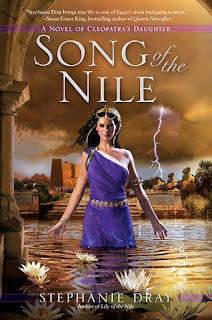 Review: Earlier this year I read and thoroughly enjoyed the first book in this series, Lily of the Nile and I've been wiggling with anticipation for this book. I'm thrilled to say that everything I loved in the first book -- Selene, the historical setting, the magical elements, the compelling detail -- is in this one as well, only amped up more. This is a darker novel that doesn't shy away from the grim reality of ancient Roman life (around 25BC-ish or so). Selene, Cleopatra's daughter, has been married and sent to Mauritania, but from the start of this book, our heroine isn't a passive pawn. As with the first novel, Dray mixes history with magic, but the fantastical elements don't dampen or soften the historical aspects, which I so appreciate. Dray doesn't age up Selene, for example, who is 14 at the start of this novel, nor does she whitewash what imperial life was like. As with the first novel, this book features a teenaged heroine but isn't a YA story; it is decidedly mature and probably not something all readers will like. I hesitate to say I enjoyed it, because some of what transpired made me feel ill, but Dray makes all the characters quite human and quite real, to the point that I loved, hated, empathized with and dismissed everyone at some point, even Selene. It's a maddening, wonderful feeling, and for me, it felt like an accurate representation of what life would have been like for Cleopatra's daughter. You want royal intrigue, this is your book! I was sad when the book ended -- I could have used another 300 pages -- and I'm not sure if there's another book coming or not, but I'm desperate for more of Selene and her world. I loved Mists of Avalon but found rest of Bradley's series to be very thin. In this case, Dray's books get better and better; her world-building and character-development is nuanced and compelling. This is tawdry hist fic with a little more steel in the spine, and I mean that in the best way. Get Lily of the Nile first then grab this one! These so sound like great books, and like something that I would really like. I do like books that leave me a little scandalized, so your analysis of this one makes me think that I would have a lot of fun with. I am so glad to hear that this one didn't disappoint and that the series continues to impress. I will definitely be looking for this book! Happy Halloween! @Heather: A little scandalized is totally right -- at points, I was shaking, and it came not just from the salacious plot but also because the characters all felt pretty real. I was enraged and moved constantly -- it was quite a roller coaster, in the best way! I do hope you try these two someday -- they're deliciously escapist! Great review, Audra! I haven't read the first book yet but I still had to go out and buy the second because of all the glowing reviews. I really need to get to these soon. @Amy: Thank you -- it's really a marvelous book -- despite what might be uncomfortable plotting for some readers, I find Dray makes everything so intentional and so in-character that I'm not horrified for horror's sake. I do think each book improves -- the history, the writing, the characters -- I'm totally ready to reread this one already! Audra, this sounds like an interesting series of novels. Ever since I was a little boy I was fascinated with all things ancient Egypt, Greece, and Rome, and I still am. Interestingly enough, I am reading Marion Zimmer Bradley's novel, The Firebrand, that tells the story of the Trojan War form the perspective of Kassandra, the Prophetess. From my readings in Homer, Aeschylus, and Euripides I have really developed an interest in learning more about both Kassandra and Klytemnestra (Agamemnon's wife). @Chris: I think you'd greatly enjoy Stephanie Dray's blog -- she shares a lot of her research and details about the figures she writes about -- many of whom are forgotten by history. I love her attitude toward history -- especially her take on 'pagan'/non-Christian religions during this era. Very level-headed and respectful, which makes the books feel even more real. These two books are quick reads -- engrossing, quick paced -- so do let me know if you pick them up -- they're marvelous! This one sounds good to me as well...alas I need more hours in the day. Thanks for the lovely review. I just wanted to stop in to say that there will indeed be a third book and I'm working on it now! Wow, Marion Zimmer Bradley meets Egypt? I haven't heard of this series, but it looks like you've added another one to my TBR! Thanks, Audra. As soon as I finish the book I'm reading now, I will be starting Lily of the Nile and then reading this book. I'm glad to hear you enjoyed it, and it says a lot that you wished it was longer! Great review! I'm glad you liked this one! I have to admit that I preferred the first book to this one, but that's not to say that I didn't like this one. I'm really looking forward to the next book though! I am about halfway through this one right now and it is really good. I loved the first one too. Unfortunately I had to put it down for tours but I'm hoping to finish it up soon. Stephanie has a great series going with this one!